The other lines represent inside this area are different feeds running through the fusebox, the letters either end should match up with the diagram next/previous in sequence. Problem is in the Haynes most arn't in sequence and we have several missing diagrams! Items inside this labled Sxx i.e. S17 in this diagram, refer to fuses, here fuse #17, 10amp. Also to the left you can see numbers in small square boxes, these refer to relay sockets. Below the fusebox, you can see letters with numbers, 1st one is A25. These refer to the plug & pin numbers on the rear of the fusebox, in this case plug A, pin 25. Check out my fusebox FAQ for pics of the rear of the fusebox to help you find them. Yet again haynes buggers this up as it only shows the front & rear of the pre-90 fusebox, not the post-90 one even though it has post-90 diagrams! The bits in-between are relitively self-explanitory, especially when you have a matching key to go with the diagram. The various T numbers refer to plugs around the car, e.g T2a refers to a 2 pin plug, a. which you can then check in the key. The line along the bottom of the diagram represents earth, you often see a number in a circle which tells you where in the car the earth point is. The Haynes keys mostly have everything you need but some of the earth points and plug designations arn't correct or missing, but its not that much of an issue. Sometimes you'll notice a small box with a number on the inside on the end of a wire, in this diagram we have 28 and 12. This refers to the current track number the other end of the wire continues, and again the haynes lets us down, often the wire track we need is missing or out of sequence which makes it difficult to find the wire you need. For example, this particular diagram is completly missing from the haynes manual! Last of all notice the numbers along the bottom of the diagram, from 29 to 37. These are the current track numbers that I mentioned in the last paragraph, if you look at the diagrams in the haynes you can see for yourself most of them are out of order. The diagrams should start at current track 1 and continue in sequence if you are to have any hope of following them properly. The bentley diagrams are much better, however they're US specific s othe KR 16v and carb engines dont appear. 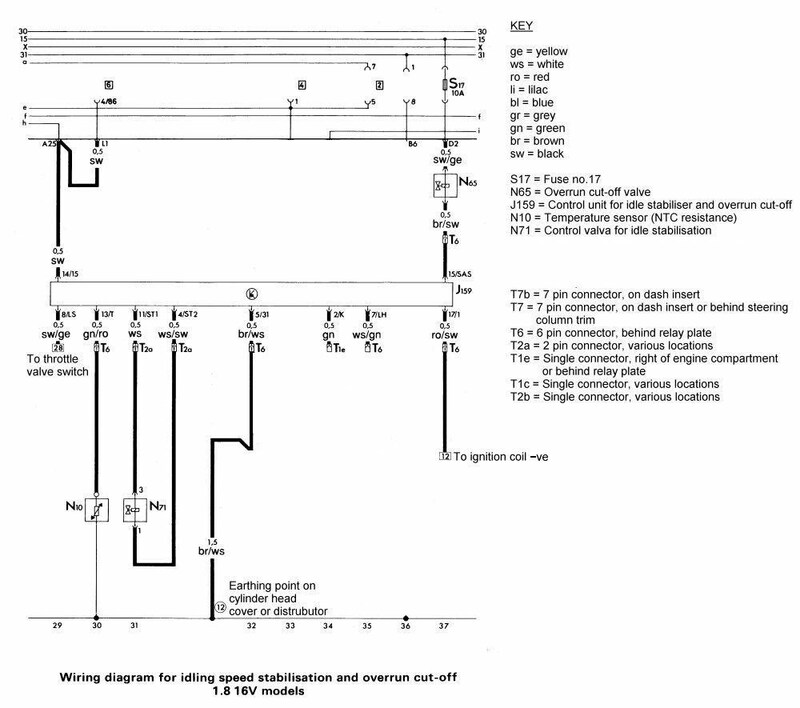 You can mostly get buy but I am yet to find a complete proper 90spec 16v MK2 wiring diagram, so far I have only tracked down the ISV controller part! is this your praise of the car or the german? Theres a awesome guide I found from VW courses online.